Oh J.R., what are we going to do with you? It's been two days since J.R. Smith earned himself a stern warning from the NBA for untying Shawn Marion's shoe during a game, but now the league has decided to fine Smith $50,00 for "recurring instances of unsportsmanlike conduct," which is a hilarious way to describe untying a person's shoes. Hey, the Knicks won last night. Weird! Too bad they had to play dirty to get this one. "I wasn't really too concerned about [getting fined],'' Smith said after the game. 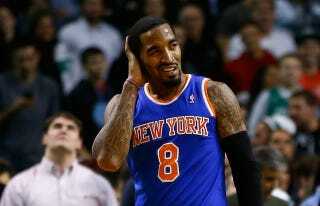 When Michelle Rodriguez becomes the owner of the Knicks, J.R. Smith will be the first player she signs to a max contract.